We have noticed an increased number of links to fake (pirated/illegal) WinFax software. These links contain malware and viruses. We also noticed fake links to file torrents. 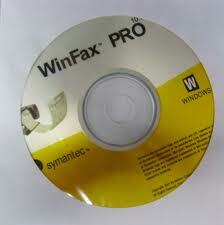 There is no such product as WinFax for Windows 7/8/10 (x64). These are fake torrents and contain virus/malware. There is no version of WinFax software that will support any x64 operating system . Stay away from these links! If you purchased WinFax software and have a questions regarding if it is fake or not, let us know and we can check it out for you. If you purchased a download of Symantec WinFax PRO, it is an illegal copy and could contain malware. 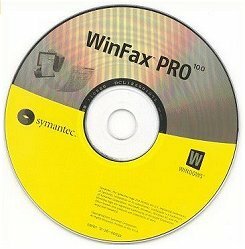 WinFax PRO is no longer being sold & distributed by Symantec and the only way to purchase a legitimate version is 2nd hand (used) or New Old Stock (NOS) from a retailer. There are MANY counterfeit CDs in existance, and they are poor quality copies of the original. Don’t get ripped off by purchasing a WinFax PRO CD! The picture above is an image of an actual FAKE / COUNTERFEIT WinFax PRO CD. If in doubt, ask the seller to send you a picture of the actual CD they are selling. Compare it with the picture here. It is difficult to determine the fake from a real CD if you have never seen an authentic CD, but once you compare the two, the differences are easy to spot. The first clue is if your CD contains the version of WinFax PRO. All official CDs will only list version 10.0 on the CD. Authentic CDs do not include version identifiers 10.02 or 10.03. This is not listed on the CD anywhere. Official CDs are on silver “shiney” surface where “WinFax PRO” is printed. A dull matte-finish is a fake CD. 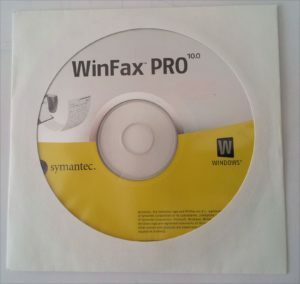 Here is an image of a real “10.02” or “10.03” WinFax PRO CD ROM. See that the silver portion is shiney, and the version has “10.0” beside WinFax PRO. The fake version has 10.03 printed on the CD ROM.